Peaking Behind the Scenes- our CSOL Designer Showhouse Rooms Come to Life! The AFI team has been hard at work making Alexandre’s vision for the Charleston Symphony Orchestra Designer Showhouse come together. The Showhouse is now open through April 15th, make sure you come by before it’s gone! Seeing the finished project is the best part. But, being able to peak behind the scenes at all of the hard work and people that are involved is always educational- and entertaining! We were fortunate to have the help of Smooth Move Professional Moving Services to safely move many of our gorgeous Couture Lamps, Global View accent pieces, Taylor Burke Home pieces and Stanford chairs into the Showhouse. We work with Smooth Move often and they really do help make transitioning a space go much more smoothly. The space in the Showhouse for Alexandre Fleuren Interiors is the Carriage House with both a Men’s Study, Ladies Retreat and Powder room. The amazing challenge was to take these spaces and make them as individual, yet cohesive as possible. The design came to life with the help of Phil from Architectural Millworks who did an amazing job hanging all of our drapery rods, beautiful photography from Chris Smith Photography and artwork from The Principle Gallery in Downtown Charleston. 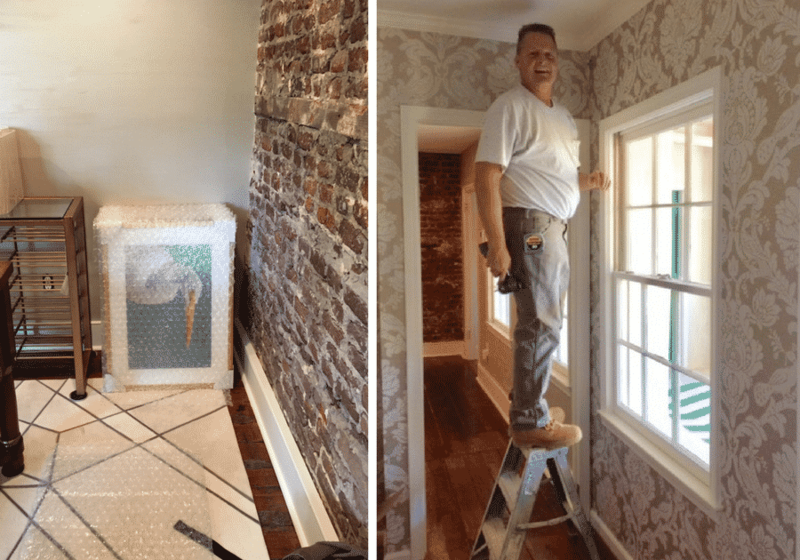 Hanging wallpaper, drapes and art becomes quite the mathematical challenge in a historic Charleston home- yes kids, there really is a practical application for algebra! Having to deal with walls that aren’t plumb is a difficult but typical task in an older home- fitting an oversized chair through narrow doorways was something entirely different. Ed, Alexandre’s husband, was instrumental in figuring out how to fit a certain gorgeous and large chair from Thibaut Furniture into our Carriage House space! He also helped everyone stay on task- that can be difficult with so many moving parts. It wasn’t all work and no play though- check him out with a walrus head from one of the other rooms! A little levity goes a long way when working with a tight time schedule. Finally, once all was unpacked, steamed, placed, inventoried and photographed- we were all able to enjoy the amazing space, and picture it as our own. . .